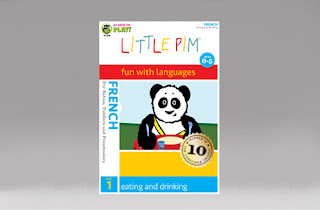 Little Pim is a great online learning tool to help younger children under the age of 6 learn another language. Children from birth to 6 years old are sponges and are able to learn more between those ages. Scientific research shows that learning a foreign language comes naturally for children when they start at an early age. Little Pim is the brainchild of Julia Pimsleur Levine, an award-winning documentary filmmaker and mother. Julia was inspired by her own bilingual childhood; she learned French fluently by age six and is the daughter of Dr. Paul Pimsleur, who created the Pimsleur Method, the popular language learning program for adults. The Entertainment Immersion Method® integrates the latest scientific research regarding kids’ language learning and brain development. Pimsleur Levine developed the series with leading neuroscientist Dr. April Benasich, director of the Rutgers Infancy Studies Lab. Little Pim has some great DEALS check out the WEBSITE for more info!! I received the Little Pim French~ disc 1 Eating and Drinking CD for review. She has watched the DVD many times already and has already picked up some new words in french to share with her class when she gets back to to school. She says its fun to follow along and learn with Little Pim. In this French DVD for toddlers, babies, and preschoolers see Little Pim and friends making and eating food while having a great time discovering new tastes. DVD 1 introduces more than 60 French words and phrases for meal times. disclosure~ I received the Little Pim French DVD in exchange for my review.